Amman: Jordan’s King Abdullah urged the European Union to take a firm stand against Israel over clashes at Occupied Jerusalem’s Al Haram Al Sharif, as he met the EU president on Sunday. “The international community and the EU in particular should adopt a firm position to halt these serious aggressions and violations” by the Jewish state, he told Donald Tusk. The king, quoted by the royal palace, warned that Al Haram Al Sharif would have “serious consequences,” especially in the absence of peace talks between Israel and the Palestinians that have been stalled since April 2014. Jews raided the site in occupied east Jerusalem for the start of the Jewish New Year on September 13, sparking days of clashes between Muslims and Israeli occupation soldiers on and near the plaza that houses the Dome of the Rock and Al Aqsa mosque. King Abdullah warned on Monday that any further “provocation” in Occupied Jerusalem would damage ties between his country and Israel, linked by a 2004 peace treaty. Jordan, which has custodian rights over Al Haram Al Sharif, withdrew its ambassador from Tel Aviv after similar clashes in November 2014. Ramallah: The Palestinian security forces disciplined eight officers on Sunday after the clubbing of a teenage boy by security forces was caught on video. The security forces were preventing dozens of protesters from reaching an Israeli checkpoint near the West Bank city of Bethlehem on Friday. The video showed protesters throwing stones and bottles and then several officers beating the boy. The National Security Forces said that four senior commanders were suspended from their duties and will face “disciplinary measures.” Another four officers were sentenced to three months in prison. The beating video circulated widely on social media and sparked criticism of the Palestinian leadership and demands to punish the officers. On Sunday, dozens of protesters gathered outside the security forces’ station in Bethlehem and threw stones, injuring nine officers, according to the security force. Palestinian security forces have limited powers in the West Bank but are often tasked with holding protesters at bay in areas where they operate. 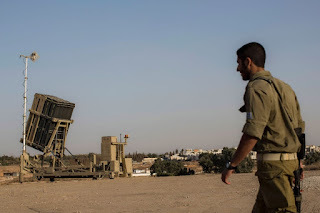 Also Sunday, Israel placed an Iron Dome rocket defense battery in the southern town of Sderot, where a rocket launched from Gaza exploded on Friday, damaging a house and a bus. 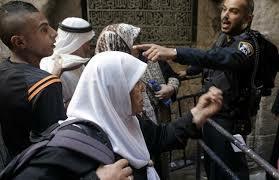 Tensions have spiked between Palestinians and Israelis recently over a Jerusalem site holy to both Jews and Muslims. Clashes between Palestinian protesters and police have erupted in Jerusalem and several rockets have been fired from Gaza.